Jessica Kensky said that she and her husband each lost a left leg in the attack and that she eventually had to have her other leg amputated as well. "I did not want to become a bilateral amputee," Kensky said. "I wanted to paint my toenails. I wanted to put my feet in the sand, and I wanted to do all these things. To lose the second leg was a gut-wrenching, devastating decision." Kensky testified at the federal death penalty trial of bomber Dzhokhar Tsarnaev, whose own lawyers have acknowledged his involvement but said he we influenced by his other brother, Tamerlan, who was killed in a getaway attempt days after the bombings. In the first two days of testimony, prosecutors called more than a dozen witnesses, including several marathon spectators who described losing limbs. About two dozen survivors, friends and family members were in the courtroom Monday. Three people died and more than 260 others were injured when twin bombs exploded at the finish line of the 2013 Boston Marathon. Kensky told jurors that chaos erupted after the blasts and that she remembers trying to prevent her husband from seeing his leg. She said she didn't know she was on fire until a man shoved her down and began trying to put out the flames. When she arrived at the hospital, she heard the voices of other bombing survivors. "You could hear people just screaming," she said. "Very animalistic screams." She didn't realize the extent of her injuries immediately because the front of her legs looked intact. "At one point, they rolled me over and that's when I could tell that things were really bad, just by the looks on their faces," she said. Her left leg was removed below the knee during surgery, and doctors attempted to reconstruct her right leg. But after seeing specialists around the country and having multiple surgeries over more than 18 months, Kensky had surgery to amputate her right leg this January. Also testifying Monday was a woman whose close friend died in the attacks. Danling Zhou said her friend Lingzi Lu grabbed her arm after the first bombing. "What happened?" Zhou recalled Lu asking. "What should we do?" Zhou thought it was a sewer explosion. But seconds later, the second bomb exploded. Zhou said she looked in front of her and saw a man whose legs had been blown off. She said when she looked at Lu, she thought she would be OK because she seemed to still have her arms and legs. She found out later in the hospital that Lu had died. Others testifying Monday included Lynn firefighter and paramedic Matthew Patterson and Dr. James Bath, who assisted some of those injured in the marathon bombing, and Anthony Imel of the FBI's forensic audio and visual unit. 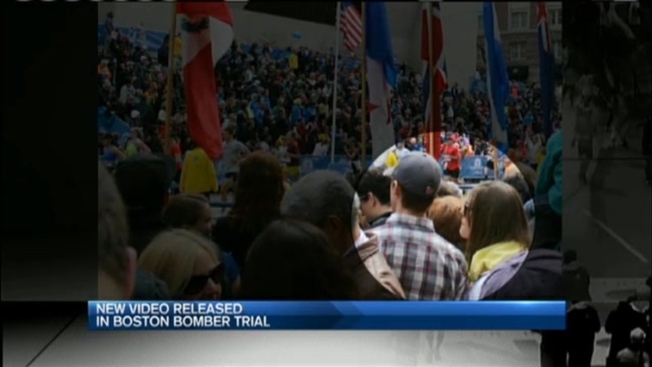 Imel came to Boston on April 16, 2013 to help with the bombing investigation.